A mutant strain of the virus has been confirmed in China and Vietnam, and is believed to have been spread by wild bird migration. 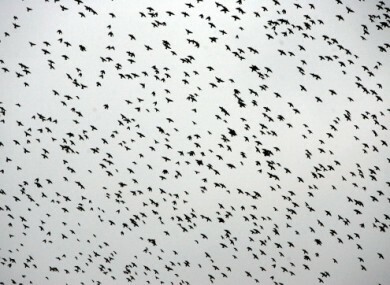 File photo of a flock of starlings, picture date: 2005. THE UNITED NATIONS’ Food and Agriculture Oganisation (FAO) has issued a warning about the possibility of a “major resurgence” of avian flu, after a mutant strain of the virus was detected in China and Vietnam. The mutant strain of H5N1, which seems unaffected by existing vaccines, is thought to have been spread by wild bird migrations bringing it to previously virus-free countries – including Israel, the Palestinian territories, Bulgaria, Romania, Nepal and Mongolia, according to FAO Chief Veterinary Officer Juan Lubroth. Last week, the death of a six-year-0ld Cambodian girl of H5N1 was confirmed by the World Health Organisation (WHO). The child is the eighth person to die of the virus in the country so far this year – all cases discovered in the country in 2011 have proved fatal. According to WHO figures, the H5N1 virus has infected 565 people since it first appeared in 2003, killing 331 of them. At its peak in 2006, a total of 63 countries were affected by avian flu. It has also resulted in the culling of more than 400 million domestic poultry and caused an estimated $20 billion in economic damage worldwide. Vietnam has suspended its springtime poultry vaccination campaign this year, and most of the northern and central parts of the country (where H5N1 is endemic) have been invaded by the new virus strain, known as H5N1 – 2.3.2.1, reports FAO. Email “UN agency warns of potential bird flu resurgence ”. Feedback on “UN agency warns of potential bird flu resurgence ”.